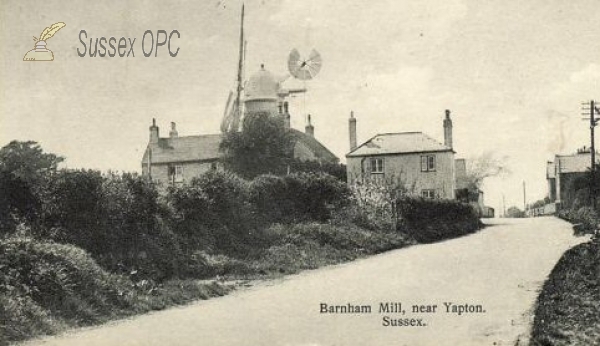 The original parish of Barnham took its name from 'Beorna' whose 'hamm' or enclosure was in this low-lying country. The church was recorded in the 1086, but no history is known before that date. Originally the village was clustered around the church, and up to the Middle Ages a tidal creek ran to within a few yards of the building. Fishing, and not farming, was the main occupation of the villagers, as was smuggling, and there is said to be a secret underground passageway leading to the church! The modern village of Barnham has spread northwards, nearer to the railway station, and this has left the church in comparative isolation surrounded by country and farmland. Although mentioned in the Domesday Book, excavations have revealed artefacts of Saxon origin, and it is thought that originally a Saxon church could have stood on the site. Parts of the church are characteristically early Norman, the font being of the same period. Unfortunately this has suffered severely, probably during the desecration of the Cromwellian period. Considerable changes took place in the 13th century--the Norman Chancel was replaced by the present more spacious one, a north aisle was added, and the adjacent nave pierced with arches to give access. After the Reformation the aisle was demolished and the arches filled in. The church has one bell, alto in voice, weighing over 3 cwt and is one of the oldest in Sussex. It is believed to be the last one cast by John Rufford in 1348, and is still in its original condition. Dominating the East end of the Church is the stained glass window, designed by Miss Jean Fullylove and placed in the Church in her memory in 1949. Although it is modern, it is in the style of 15th century glass, and depicts events from the legendary life of St. Mary the Virgin. 125 individuals in the OPC Database for the 1841 census. 4 individuals in the OPC Database for the 1851 census. Grid reference: 496026, 104500 ~ View on: Google Maps, Open Street Map, Streetmap, National Library of Scotland Map or Oldmaps. There are 39 protestation returns for this parish in the OPC database.